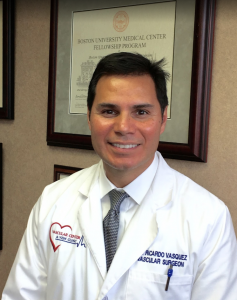 Welcome to the Vascular Center and Vein Clinic of Southern Indiana, the practice of Ricardo Vasquez, M.D., Board Certified Vascular Surgeon. Our practice serves the greater Bloomington area. From life-saving aortic aneurysm repair, to treating and eliminating all varicose vein conditions, we are dedicated to addressing your needs. We perform the most comprehensive management of varicose vein treatments, including laser ablations and cosmetic vein procedures. Dr. Vasquez’s office has the only nationally accredited vascular lab that performs all venous and arterial ultrasounds in Bloomington.